Stories about con artists enjoy a long and varied history in Hollywood, but where the con man is the central character notable standard personality traits are discernable and common to all. I recently saw The Wolf of Wall Street and American Hustle within a couple of days of each other and was struck by the similarities between Jordan Belfort (Wolf) and Irving Rosenfeld (Hustle), the two main characters. However, I came away from each movie with a very different feeling, and it wasn’t until after some thought, and a discussion with the person I saw one of the movies with, that I got a handle on why I enjoyed one movie enormously and simply(?) admired the achievement of the other. Essentially, Belfort and Rosenfeld are the same type: men who start out with little or nothing and through dint of energy and wit forge a place for themselves in the dog-eat-dog world in which they live. If that involves conning other people out of their hard-earned money, so be it. In fact, in some respects, this makes the smell of success all the sweeter. American Hustle largely adheres to Hollywood’s traditional depiction of con men as loveable old rogues a la Max Bialystock (of The Producers), men who are at heart good people, or at least beyond reproach because they go about their business with panache. We admire their cleverness and ability to survive. After all, a fool and his/her money are soon parted and why should we feel sorry for them. Where American Hustle departs from the norm is in a script and a performance by Christian Bale that add complexity to Rosenfeld, around whom the story revolves (even though the movie utilises the ensemble cast model). Rosenfeld is dealing with a troublesome wife (Jennifer Lawrence), a partner in crime (Amy Adams) who he is falling for big time, the cops, the mob, and conflicting loyalties with regard to one of the people embroiled in his latest scam. How everything pans out makes for a highly enjoyable story. But if we stop for a second and examine who and what Rosenfeld is, we realise he is at base a criminal who has probably ruined the lives of countless people. In the run up to the central scam of the movie we never see the fallout from Rosenfeld’s activities, just a succession of fools who apparently deserve everything they get. Ultimately, American Hustle is modelled on a Hollywood tradition that encourages us to park any concerns we might have for the duped so we can allow ourselves to enjoy the story of an independently minded maverick who claws his way to the top, at least within the limits of his particular world (it could be argued that, to some extent, this tradition is an embodiment of the American Dream, which holds dear to its heart the uniquely American concept the individualist and the idea that literally anyone can make it. Perhaps it’s the perpetuation of this concept that has seemingly absolved successive US governments and the big corporate taxpayer of social responsibility and led to so many American citizens feeling marginalised). Cue The Wolf of Wall Street. Here we have a movie that, at first glance, fits into the traditional Hollywood con man oeuvre. Belfort arrives on Wall Street keen to make a mark only to see his efforts crumble before his eyes before he has properly gotten off the starting blocks. He finds himself back at square one and struggling to survive. Thus begins Belfort’s climb out of obscurity and financial uncertainty via distinctly dodgy means. During the first half or two thirds of the movie, Belfort is, on the face of it, portrayed in the classic canny rogue fashion we’ve been primed to accept by countless previous Hollywood incarnations. However, the scale of the defrauding of people, and the drug taking and debauchery that forms an increasing part of Belfort’s chaotic and nihilistic life, is such that the viewer becomes jaded and not a little unsympathetic towards the main character as things begin to spiral out of control. I left the cinema feeling I’d been to some extent contaminated by close proximity to the story of Belfort. I noted the rest of the departing audience were similarly discomfited; there was none of the usual banter you’ll hear people engage in after a movie. At first I felt my unease was triggered by what seemed to be a celebration of rampant capitalistic greed. However, on further reflection and discussion, it became clear to me that Scorsese had, in fact, strenuously avoided any hint of moralising throughout the movie. Despite several humorous episodes early in the movie, a close inspection of the story reveals no obvious championing of Belfort’s deeds. The reverse is also apparent: there is no evident trace of Scorsese the director’s disapproval of the main character’s behaviour; right down to the lack of expression of the face of the FBI agent on the subway towards the end of the movie, a contravention of audience expectation. Scorsese attempts to tell it as it is, and wants the audience to be allowed to make its own mind up. 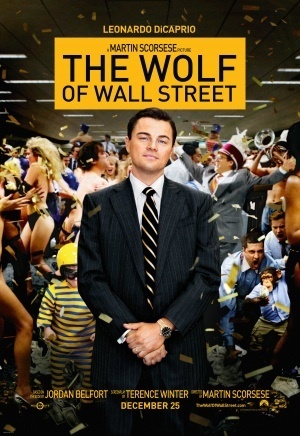 When one considers that The Wolf of Wall Street is closely based on the book written by Jordan Belfort himself, one realises that what Scorsese has achieved is nothing short of miraculous for a big budget Hollywood movie. To use a classical music analogy, in 1937 Shostakovich, under pressure to simplify his music and produce something that fit the tenets of socialist realism, composed his Symphony No. 5, which was to extol the virtues of Stalin’s rule and the communism in general. The music was full of bombast and powerful, strident phrases that spoke with nationalistic fervour. However, seeded into the music were notes of discord that were plain to hear by those with the right musical vocabulary. Stalin and various Communist Party officials knew something was off but couldn’t quite put their finger on it. In the end they had to be seen to accept the symphony for what it purported to be. It was a classic ‘Emperor’s New Clothes’ scenario. And for all that The Wolf of Wall Street purports to be amoral, I think what Scorsese has done here is something similar. I can imagine Jordan Belfort is thoroughly delighted with his portrayal in the movie. I’m pretty sure some of his former Wall Street buddies are equally impressed. But I figure most people leaving cinemas all over the world are doing so the same way I did: with a bad taste in their mouth. I still enjoyed American Hustle a lot, and recommend it to you, but The Wolf of Wall Street, a much less likeable movie, is the greater achievement. Without being overtly moralistic, Scorsese has given us the great moral tale of the 21st Century. I’d never thought about con-men in Hollywood before, but you’re quite right – they’re always portrayed sympathetically. The Sting and Paper Moon have con artists as the salt of the earth. They are essentially harmless, lovable rogues. The Grifters was a far less popular film, showing the moral vacuum – and I only found out when I looked it up, that was produced by Scorcese. Interesting that Scorsese produced The Grifters. Yes, that’s a rare movie where the con artists are portrayed in an unsympathetic light. That’s probably why it wasn’t so popular.